The Pelikan M805 Ocean Swirl is a special edition with gorgeous turquoise swirls against a black background. The pen is complemented with palladium accents and a rhodium-plated 18k nib. Although Pelikan calls the material used for this pen “unique,” they must mean the color, as the material appears to be common acrylic, albeit with a distinctive color and pattern. It is quite striking, especially in sunlight. It exhibits depth and chatoyance, and the color changes from turquoise to blue depending on the light. Pelikan’s packaging is elegant, although I never know what to do with fancy boxes other than store them in my office closet in case I decide to sell the pen one day. Nevertheless, the wood-grain-like box is sturdy, and inside is a faux-leather envelope encasing the pen. I suppose you could use the envelope as a carrying case if you wanted, but it seems rather flimsy, especially the elastic band. I much prefer Franklin-Christoph’s genuine leather, zippered pen envelopes. I used to think the M8XX series pens were too large for my hand, but over the years of pen collecting, I’ve been drawn to larger pens. I now find M400s and M600s too small, and I prefer the M800 size. It is 140mm capped, 127mm uncapped, and 165mm posted. It fits perfectly in my hand and it is well-balanced and not too heavy (29 grams). I don’t write with my pens posted, but you certainly can post this pen. I think it throws the balance off, but others might find the extra weight more comfortable. Like most (if not all) Pelikan pens, the M805 Ocean Swirl is a piston filler. The piston turns smoothly, as you would expect from German engineering. It holds about 1.5 ml of ink. One thing I really love about Pelikan pens is that you can remove the nib easily and thoroughly clean the barrel. The cap finial is different from other Pelikan pens I own in that the birds are etched into a matte silver background. My other Pelikans have shiny finials, but I like the matte finish. Although you can see some translucence in the cap with you hold it up to the light, the barrel is opaque. So, unlike some of the other Pelikan pens, you can’t really see the ink level. I ordered a fine nib for my Ocean Swirl. It has Pelikan’s usual gorgeous scrollwork and bird motif. It writes smoothly. The line is closer to a medium in width, but that’s not a surprise. Pelikan nibs tend to be wider than Japanese ones. There’s nothing fancy or special about this fine nib—no flex or line variation, but I wasn’t expecting any. I may eventually send this nib off to have it ground into a stub or italic because those grinds make my handwriting look 100% better. My only disappointment with this pen is the color variation. My pen has two swaths of gorgeous swirly turquoise and two swaths that appear much darker with a little turquoise. (The color difference is much more noticeable when the pen is not in direct sunlight). Note the beautiful swirls on this side of the pen. Yet this side of the pen is much darker with glimpses of turquoise. I wish my pen had more consistent turquoise swirly goodness than it does. Apparently, this varies from pen to pen. So, if you want an Ocean Swirl with lots of color, I suggest that you purchase it from a brick and mortar store where you can choose a specific pen. Or, if you are ordering online, ask the retailer to send you photos of the Ocean Swirls they have in stock, and pick one with lots of turquoise. Pelikan recently reduced their prices, which is a welcome change for pen collectors. Whereas last year the retail price for the Pelikan M800 Renaissance was $800.00, this year the M805 Ocean Swirl retails for $650. Actual purchase price varies a bit between retailers. You can purchase the Ocean Swirl from Goldspot Pens for $519.95. 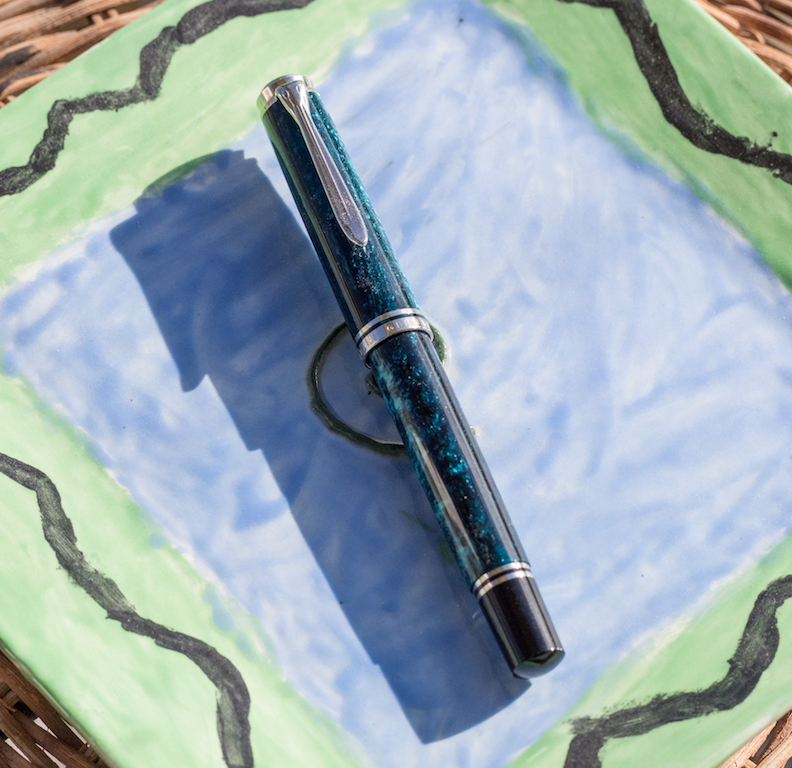 The Ocean Swirl is a beautiful pen with eye-catching colors. It’s one of those pens you can stare at for a long time just for the sheer pleasure of enjoying the design. When you buy a Pelikan, you know you’re getting a terrific piston filling mechanism and this pen is no exception. The M8XX size is a good size for many people. The pen is well balanced and comfortable in the hand. People with small hands may find it too large, but I have small hands and the M800 size is perfect for me. My nib wrote perfectly, straight out of the box. This is usually my experience with Pelikan pens, but there’s always a possibility of getting a dud. Just make sure you buy from a retailer that can test the nib for you prior to shipping or that has a good return policy. My only complaint about this pen is that mine doesn’t have enough turquoise color to it. It has two swaths of turquoise and two swaths of black, and if I don’t screw the cap on just right, the swaths don’t match up, which makes me crazy. I strongly suggest that you ask to see the Ocean Swirl before you purchase it. Posted on January 12, 2018 by Susan Pigott and filed under Pelikan, Fountain Pens, Pen Reviews.